Did someone call the Demon Hunters? 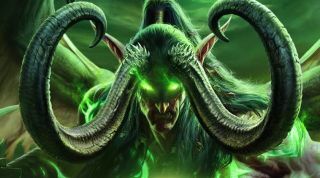 As promised, World of Warcraft’s demon invasion of Azeroth pre-launch event has kicked off, bringing with it new outfits, weapons, cosmetic items and playable Demon Hunters for those who preordered. For the next three weeks the invasion will take place over six zones—including four-stage events—and will house close to one hundred spawning demon bosses. Speaking to that last point, the latest lore-tied cinematics to have surfaced (as posted by MMO Champion) reveal some pretty hefty story information. As you might expect, spoilers to follow. The questline which runs alongside the pre-launch event takes place in the Broken Shore where the Alliance and the Horde sort-of unite to combat the start of the demon invasion. Upon completion, depending on who you side with, you’ll be met with the following cinematics. Warning: tears incoming. Horde players also get a second cinematic which reveals the aftermath of the above. Poor Ghost Wolf and poor Vol'jin, then. The scene really has been set (or what’s left of it) for WoW’s latest Legion chapter, due to arrive August 30.